Garlic adds flavor to these crispy oven-fried chicken strips, along with a variety of herbs and Parmesan cheese. Use half panko crumbs in the recipe for an extra crispy coating. The panko bread crumbs make them super crispy on the outside and tender and juicy inside. If you prefer a cornflake crumb coating, add some to the breading mixture or replace the breadcrumbs and panko with them. 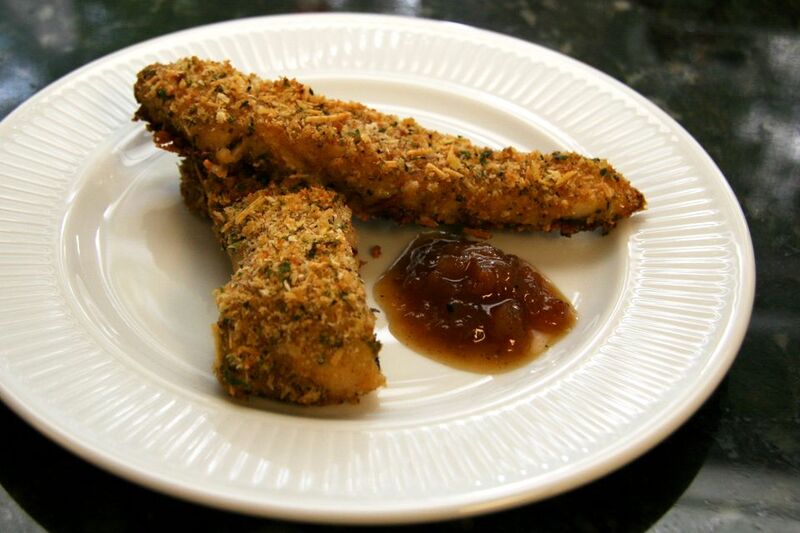 The pictured chicken strips were made with half panko and half fine dry breadcrumbs. These chicken strips make a tasty snack for a game day gathering or enjoy them with French fries or chips for an everyday family meal. Heat the oven to 375 F / 190 C / Gas 5. Line a rimmed baking pan with foil and lightly grease or spray it with nonstick cooking spray. In a small skillet over medium-low heat, melt the butter with the olive oil; add the minced garlic and continue cooking for 1 minute. Remove from the heat and set aside. Cut the chicken breasts into strips about 1 1/2-by-4-inches, and try to keep them somewhat uniform in size. In a plate or shallow bowl, combine the bread crumbs, Parmesan cheese, parsley, basil, salt, and pepper. Stir the mixture until well blended. Dip the chicken pieces in the garlic and oil mixture to coat thoroughly, then dip them in the bread crumb mixture, turning until well coated. Arrange the chicken strips on the prepared baking pan; bake for about 20 to 30 minutes, depending on the thickness of pieces, until chicken is cooked through. The temperature of the chicken should register at least 160 F on a food thermometer inserted into the thickest piece of chicken (not touching the pan). Serve the chicken with your choice of dips, along with chips of French fries for a meal. Flatten the chicken breasts slightly to an even thickness before cutting them into strips. To flatten, place a chicken breast between sheets of plastic wrap and lightly pound with the flat side of a meat tenderizer or with a heavy object. Use all or part cornflake crumbs in place of the bread crumbs. For extra tangy flavor, add a few teaspoons of Dijon mustard to the melted butter and garlic mixture before dipping the chicken.